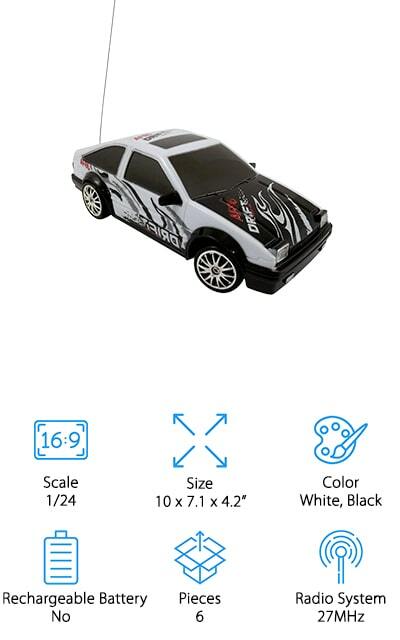 If you had a remote control car when you were little, it might be time to revisit your childhood. Today, the best RC drift cars are fun for the whole family. There are so many available, you might not know where to start. We researched the best-selling, most raved about items and put together this review to help you find the right one for you. First, let’s take a look at some of the key things to know. Scale: There are a few different options available. The largest scale we included is 1:10 and the smallest is 1:24. That’s a pretty big range but they’re all very realistic looking and a lot of fun to drive. Size: These are the basic dimensions of the car but they’re directly related to the scale. The smaller the scale, the smaller the dimensions. This gives you an idea of the size if you’re not exactly sure what the scale entails. Color: Some of these cars are multicolored while there are a few that come in a few different color options. There’s a lot of options to choose from. We even found one that comes with 2 different bodies that you can switch between. Rechargeable Battery: The large models have a rechargeable battery that’s usually compatible with a simple USB cord. Small-scale cars usually rely on AAA batteries so be sure to stock up. You’ll also need batteries for all of the remote controls. Pieces: This includes the car and the remote as well as any extras, like spare sets of tires, extra bodies, spare battery packs, and chargers. Some of these items are pretty basic while others include some nice bonuses. Radio System: This tells you the frequency of the radio system the controller uses to communicate with the car itself. Most of these items use 2.4GHz but there are a few that are 27MHz as well. 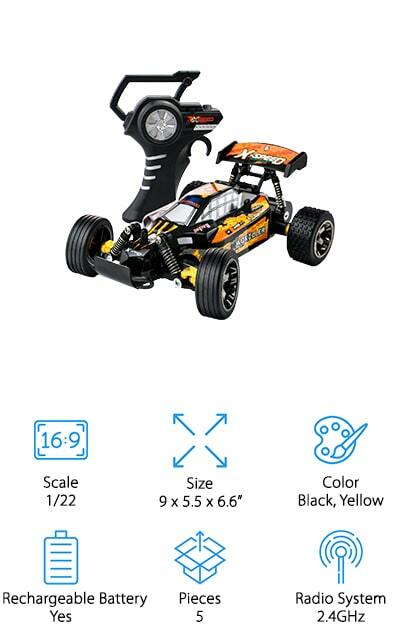 Now that you know what to look for, hopefully, you’re no longer wondering, how do I pick the best RC car? Let’s move onto our top picks so you can find the one that’s right for you. Our top and budget picks are right at the top of the list so you can get a good idea of the range that’s available even if you’re in hurry. Stick around if you can, all of these cars are super fun to drive. Alright, let’s go! 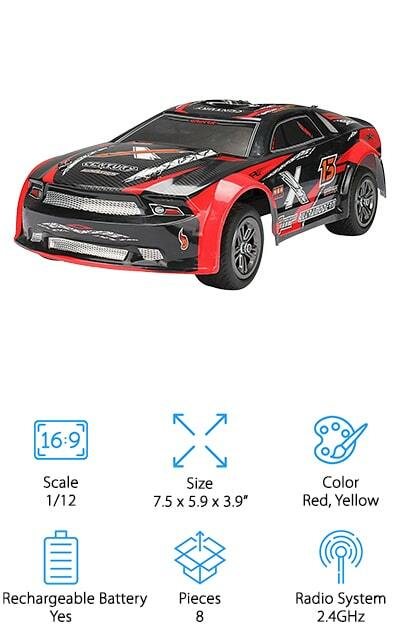 Out pick for best remote control drift car is the Redcat EPX Drift Car. It has a vivid polycarbonate body and is available in 2 different styles. One style is painted bright metallic blue, the other is brick red. To get the perfect balance between chaos and control, this car features a 27T 540 brushed motor, forward and reverse transmission, 4-wheel drive, and special drift tires that slide while maintaining momentum. Another impressive thing about this 1/10 scale car is that it has aluminum capped, oil filled shocks and an adjustable suspension so you can fine-tune it to your liking. One more thing, the battery pack and charger are included although the remote control requires 8 AA batteries which are not. Our budget pick is the Jada Fast & Furious RC Car which features styling straight from the movie. If you’re a fan, you’ll be excited to know that it’s modeled after Brian’s Nissan Skyline GT-R. In fact, it’s a perfect replica on a 1:10 scale. The high performance drifting action is impressive as there are 4 spare tires included for when it’s time to change them. That’s not all, it uses a pistol-grip controller that’s really easy to use and comfortable to hold onto. It even has a turbo button for when you need that boost of power. The car uses a rechargeable battery and a standard USB cable to charge so you can use a power bank, your car, or even your laptop. Next up is the Exceed RC Drift Star. It comes completely ready to run, pre-assembled, painted, and trimmed which makes it a great choice for beginners but it’s also loaded with features that experienced drivers will love. The brushless motor provides consistent power to deliver reliable, high-performance drifting. It has a lightweight suspension system that reduces the overall weight of the car for faster reaction times and a 4-wheel drive system and precise steering for superior control. A complete set of ball bearings make it run smoothly and the anodized aluminum driveshaft keeps the weight down while added durable, strong support. The pre-mount drift wheels feature stylish chrome plated spokes and come equipped with high-performance anti-skid tires for a great ride. The best RC drift car RTR we found in our research is this one from NQD. It features 2 motors and can hit impressive speeds of up to 15.5 mph, faster than comparable models. With rubber tires and a 4-wheel-drive transmission, this car delivers a fast and fun driving experience. The body is made of high-quality plastic and metal that’s moisture proof and so the color will never fade. You also get 2 different car shells so you can change from blue to red when you’re in the mood for something different. It’s equipped with a rechargeable battery and a USB cord so it’s easy to charge anywhere. Plus, if you need extra batteries, just call customer support and they’ll send you some for free. 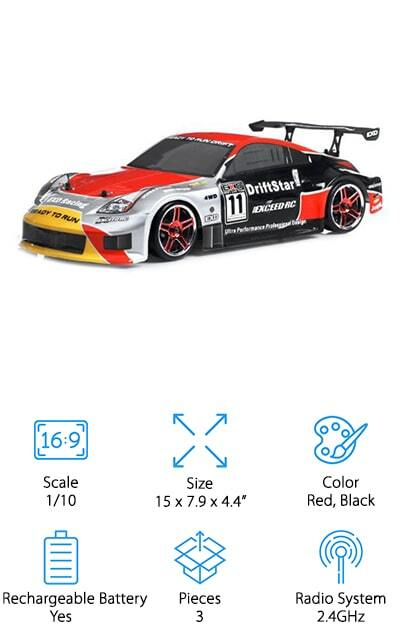 If you’re looking for something on a smaller scale, check out the Liberty Imports RC Drift King. This little beauty is small. Designed on a 1:24 scale, it’s only 7.5 inches long but this small size makes it super fast and responsive. It’s also loaded with some really cool features like working headlight, backlights, and sidelights and it comes with 2 different sets of tires, rubber tires for when you want more grip and smooth tires for flawless drifting. It’s fully functional and can easily do U-shapes drifts and figure 8’s. The remote control is comfortable and really easy to use. Just supply 4 AAA batteries for the car and 2 AA batteries for the remote. It comes with a 30-day warranty and 100% satisfaction guarantee. The FSTgo Drift Electric car has one of the best RC drift car chassis around. It comes with a rechargeable battery and a USB charger and can drive for 10 to 15 minutes with a full battery. The suspension is made for superior handling and control and the front of the car is protected by a sponge insert to help protect it from damage in the event of a crash. While it’s not waterproof, it can tolerate some splashes from water in rain or snow, just be sure to dry it off when you’re finished to make sure it lasts as long as possible. If you aren’t happy with it, return it for a full refund within 30 days or get a free replacement for a year. 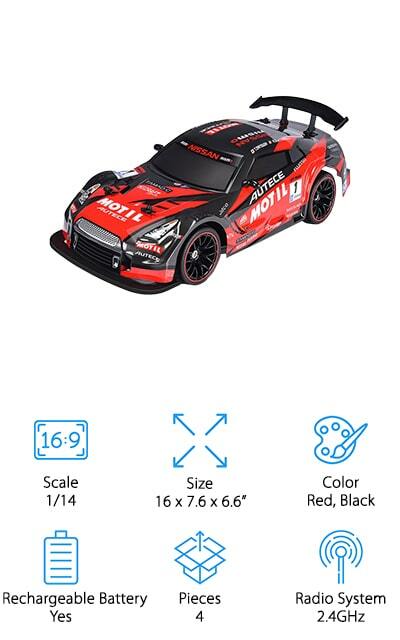 Because the 7color RC Drift Car is made on a 1:16 scale, it’s a little smaller than a lot of the models out there without being too tiny. It also performs really well. With 2 motors and 4-wheel drive, it can travel at speeds as fast as 15 mph. Drifting is impressive and it’s fully functioning so you can go in whatever direction you choose. 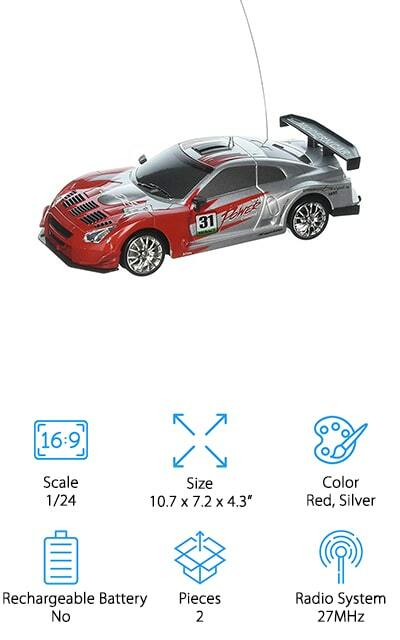 This is a great choice for best RC drift car for beginners because the alloy shell is very strong and can take a ding or two. It also has some LED lighting effects which your kids will love. The car runs on a rechargeable battery, all you have to do is provide 2 AA batteries for the remote and you’re in business. 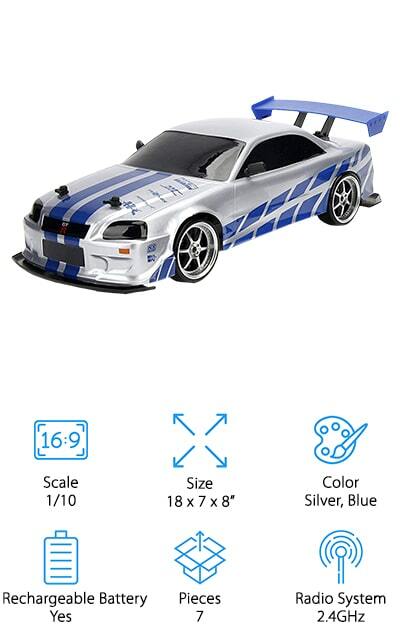 Another great choice on a smaller scale is the Team RC Drift Car. The 1:24 scale recreation is super fast and incredibly responsive. It’s fully functional and moves in any direction so you can do U-shape drifts and figures 8’s with ease. That’s not all, it even has working headlights, backlights, and bottom sidelights which create a really cool effect when it’s drifting. There are 4 rubber tires and 4 smooth tires included so you can get more grip when you need it, less when you don’t. The remote is really easy to use, too. This is also an appropriate choice for kids or beginners because it’s small, loaded with a lot of really cool features, and incredibly affordable. 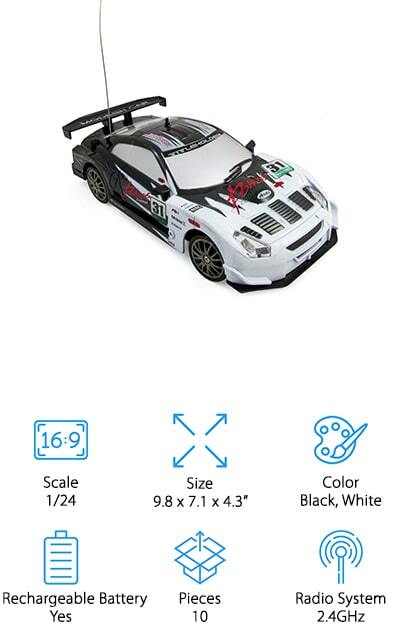 The best RC drift car for off-roading is the FREE TO FLY RC Drift Car. Each wheel is equipped with a helical spring independent suspension for resilience and steady driving. Plus, it uses realistic all-terrain tires with foam inserts that can take this car onto sand, grass, and dirt. It’s fully functional and can turn, drift, and flip with ease. The pistol grip remote has an intuitive design that’s easy to hold onto and is perfect for anyone ages 5 and up. It comes with a charger and 2 battery packs, too. This car is backed by both a 30-day money back guarantee and a 90-day replacement warranty so there’s nothing to lose. Plus, if you decide to keep it, you’ll get lifetime technical support. Last up is this 1:24 scale PowerTRC Drift Car. 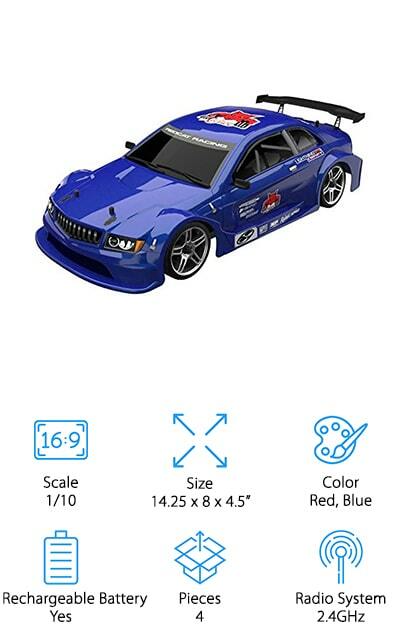 This is a great choice if you’re looking for something on a small scale that includes a lot of great features for a fun-filled drifting experience. The car uses 4 AAA batteries and the easy-to-use remote control uses 2 AAs. It comes with 2 different sets of tired, smooth for when you want to focus on drifting and rubber to give you a little more grip on different terrain. Even though it’s small and affordable, it’s fully functional, fast, and very responsive, performing both U-shaped drifts and figures 8’s with ease. That’s not all, there are working headlights, backlights, and bottom sidelights, too, which look great next to the red and silver styled body.